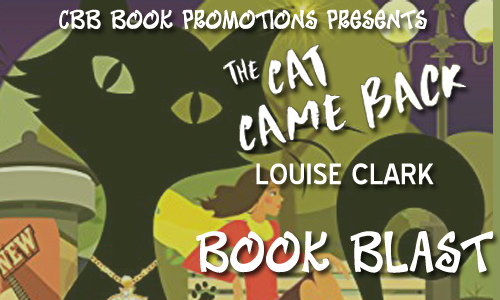 Welcome to the book blast for The Cat Came Back by Louise Clark. This is a cozy mystery with some clean romance that is available now! Stormy the Cat, rescued by journalist Quinn Armstrong, is not what he seems. Young mother Christy Jamieson just learned her husband, Frank, embezzled his trust fund, sold their Vancouver mansion, and ran off with a socialite. Worse, Frank’s trustees are telling Christy to let them handle it. But they aren’t doing anything, and Frank’s enemies are coming after her and her daughter. Desperate to find Frank and fend off his enemies, Christy asks Quinn for help. His price: the dirt on Frank. 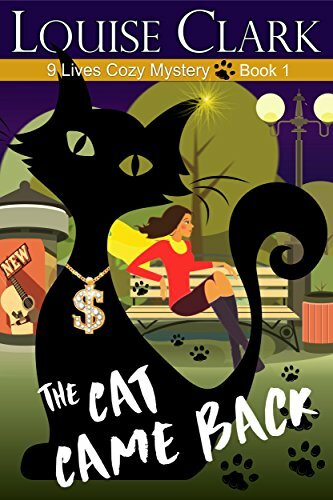 But the closer Christy and Quinn get to the dangerous truth, the more convinced they become that only the one who knows where Frank is at, is Stormy the Cat. Louise Clark is the author of nine published romance novels, including Dangerous Desires, Lover’s Knot, Pretender’s Games (Hearts of Rebellion series), and Fighting Fate. Ridgeway, a time travel novel, is part of the bestselling boxed set, Swept Through Time. In 2014 she was a quarter-finalist in the Amazon Breakthrough Novel Award contest. Louise holds a BA in History from Queen’s University and a Master of Publishing degree from Simon Fraser University in Vancouver, British Columbia, Canada. Her books have been published in fifteen countries worldwide. The 9 Lives Cozy Mystery Series—The Cat Came Back and Cat’s Paw or Culprit?—and her Radish fiction mystery romance, Recipe For Trouble, are all set in her home town of Vancouver. For more information please sign up for her newsletter at http://eepurl.com/b0mHNb. Or visit her at www.louiseclarkauthor.com or on Facebook at LouiseClarkAuthor. Giveaway is provided by the publisher, hosts are not responsible. Must be 13 or older to enter and have parental permission if under 17. Void where prohibited by law. No purchase necessary to win. Hi, I love to read mystery romance novels! And I love cats! This history sounds very good. This book such like such a fun book to read. What a fun idea. 🙂 I hope that Stormy does know where Frank is. The book sounds like a fun read! The cover is too cute! Idea is great and important. Thank. This book would be delightful and enjoyable. Thanks for this lovely feature and giveaway. Enjoyed the post. Sounds good. I love the cover of this book! It sounds like fun! I love cozy mysteries, this one sounds like a lot of fun. I always love a good mystery story. The title reminds me of a song my daughter would sing when she was little from a kiddie t.v. show. This sounds cute. Plus… cat! Always a good addition to any book! I love the 9 Lives Series. I love anything cat. I would .love to read this. Sounds like a cute series especially with cats involved. I love cats and everything cat-related. Would love to read this book! The Cat Who… series was the first mystery series I fell in love with. Since I love cats and mysteries I have added these to my TBR pile. Thanks for the giveaway! I like the book cover.